Made from the bark of the Lokta bush, this handmade origami paper provides stiffness and durability for any origami folding project. 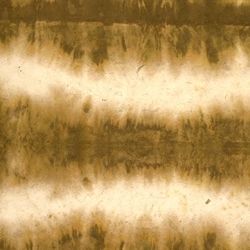 Both the face and the reverse features a tie-dye design in mustard yellow against a natural paper. See a complete description and more specifications below. Blotto - MUSTARD SEED - 6"
Blotto - MUSTARD SEED - 9"
Nepalese Lokta Paper is a strong, durable and eco-friendly paper Handmade from the fiber of the "Nepal Paper Plant," also called the Daphne Shrub or Lokta Bush. This natural Lokta Paper features subtle fiber inclusions, adding handmade beauty to whatever you create with it. Lokta Paper is ink jet and laser printer compatible. The fibers are long and flexible providing exceptional strength, perfect for all origami, especially wet-folding tecniques. With all the features of plain Lokta paper, Nepalese Blotto paper provides a subtle splash of color to your origami creations. Handmade in Nepal, the vibrant blotto coloring comes from an extensive folding and dying process using natural dyes of fruits and vegetables indigenous to Nepal. This tree-free, eco-friendly paper is acid-free and weighs 60 gsm. Choose from 2 sizes: 6" with 12 sheets per pack or 9" with 6 sheets per pack.